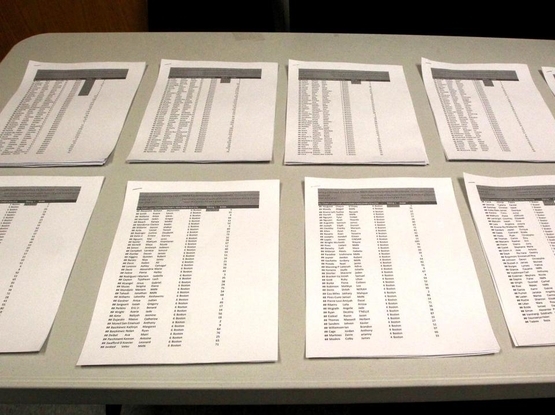 Printout of lottery results for student admission to the Neighborhood House Charter School in Dorchester. WHEN MASSACHUSETTS charter schools were still in their beta phase, it made sense to limit their number. As with other promising innovations — in technology, in medicine, in business — a gradual rollout of charter schools ensured that there would be ample time to monitor progress, adjust standards, fix bugs, and learn from experience. Massachusetts learned well. Its experiment with state-chartered public schools has proved a phenomenal success. More than two decades after the original charter law was passed, the state's 69 charter schools (25 in Boston) are among the most effective urban public schools in America. As study after study has confirmed, the benefits of a Massachusetts charter-school education are profound. They lead to improved math and language mastery, lower dropout rates, higher SAT scores, and greater college attendance. "The test-score gains produced by Boston's charters," remarks the Brookings Institution, "are some of the largest that have ever been documented. . . . Across the board, we find that urban charters produce the biggest boosts for students who most need help." So effective are public charter schools in Massachusetts that nearly 33,000 students, predominantly black and Latino, are on waiting lists to get into one. Question 2 on the statewide ballot would allow the state to approve 12 new charter schools per year. For anyone who believes in good education, for anyone who wants disadvantaged children to have a better shot at learning than they can get from chronically underperforming city schools, voting Yes should be a no-brainer. But why, after all these years, should the number of charter schools still be capped at all? Why shouldn't every public school in Massachusetts be a charter school? The most zealous opponents of charter schools are teachers unions, which resent them for the same reason that old-style taxi companies resent Lyft and Uber, or that brick-and-mortar restaurants resent food trucks. Competition stings, especially when the competitors turn out to be nimble, flexible, efficient, creative — and wildly popular. Detroit wasn't happy when Japanese automakers came on the scene. Traditional motels would love to squash short-term rental operations like Airbnb. Teachers unions have a vested financial interest in fighting off charter schools, which are not controlled by local school committees, and therefore not bound by local collective-bargaining agreements. Charter-school teachers (and other employees) are free to join a union, but almost never choose to do so. No wonder the unions are bitter. But the goal of public education isn't to keep unions rolling in membership dues. Nor is it to preserve the arrangement that public-sector unions usually insist on: rigid seniority rules, ironclad job-security, drawn-out bureaucratic disciplinary procedures, and hyperdetailed contractual provisions. The goal of public education is to teach children and prepare them for adulthood. If urban charter schools have come up with a superior means of achieving that goal, why shouldn't there be as many of them as possible? Set aside the arguments about funding and local control. Just consider results. For decades, traditional urban public schools have failed countless children, sending them into the world with a substandard education that will cripple them for life. Today there's a better option. Students in urban Massachusetts charter schools — especially students who are not white and well-to-do — achieve significantly more than their counterparts in traditional public schools. The beta phase is over. The charter innovation has been a triumph. Instead of tinkering with a charter-school quota, we should be debating how to extend the charter model to every school that might gain from it. New Orleans did something like that after Hurricane Katrina. It essentially turned all its public schools into charter schools, and measurably improved student performance in what had been one of the most substandard districts in the state. Now that's a disruption worth debating. Steven Wilson, an architect of the landmark 1993 education-reform law that created charter schools in Massachusetts, always imagined that urban school superintendents would eventually want to get on the bandwagon. "Once they saw the striking results of charters," says Wilson, who is currently the CEO of Ascend, a nonprofit charter-school network in Brooklyn, "I hoped they would march into the State House and demand the same deal for their schools. But they didn't." That deal, in a nutshell is: Far more autonomy in exchange for far more accountability. Pass Question 2, and that deal will be available to a few more schools. That's great as far as it goes, but Massachusetts can go a lot farther.